PopCap has announced that it will be an In-Parade Sponsor of New York City's 36th Annual Village Halloween Parade and is inviting fans of plants and zombies alike to dress up and come on down and join the fun. PopCap will be giving away Plants vs. Zombies merchandise to parade spectators, while fans of the runaway hit who show up dressed as their favorite game plant or zombie will be able to join the parade march and take part in a costume contest that will be held immediately after, with some "great prizes" for the best game-based costumes. 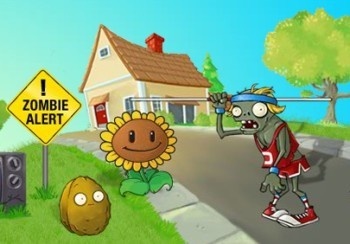 "Plants vs. Zombies seems to inspire people to new heights of zaniness, and we have the photos to prove it," said Garth Chouteau, PopCap's vice president of public relations. "We wanted to give those rabid PvZ fans a fun time and place to gather and celebrate their passion for the game. What better way than marching up 6th Avenue in New York's historic Halloween parade!" "We're delighted to have PopCap Games as a sponsor," added Parade Director Jeanne Fleming. "Their decision to open up their Plants vs. Zombies troupe in the parade to all who wish to join in is perfectly aligned with the spirit of the parade, which invites the entire city to participate in this enormous creative collaboration." To give the festivities a little more undead street cred, PopCap is also inviting members of "undead enthusiast organizations" like NYC Zombie Crawl and ZombieCon to the event in hopes of making it the biggest gathering of zombies in the history of the parade. This year's edition of the Annual Halloween Parade takes place at 7:00 pm on Saturday, October 31. Be there!